Just wanted to let you know that I have installed the clock and it is running fine. Since the photo shown I have installed my own low noise power supply which will run another clock no prob. 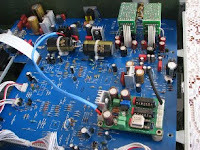 “…You can also see the Burson Op Amp replacements using discrete transistors is in the full photo from phase one. After a quick listen on headphones, it sounds very niece. I will be doing more listening this weekend. My knowledge in electronic is minimal although I am listening to music for more than two decades. I changed many systems and recently was informed about Burson by Tony from Holland. I decided to change discrete opamp and the clock. Without help from two kind people Oscar-Mexico and Manfred-Deutschland probably this project would be unsuccessful. Firstly I changed discrete opamp which was very easy process. I was surprised how good discrete opamps are. Speakers disappeared, sound become analog, especially cymbals. Space opened in all directions as well. Than I ordered the clock. To understand installation process took me some time however after that it was again very easy. 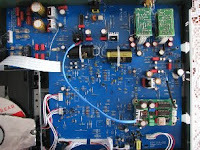 You can notice that in between pin1 U507 and the clock’s power supply is placed R22ohm as kindly recommended by Manfred. The rest as Burson’s page advising. Sound, improved again, noticeably cymbals and bass too. The only think I disliked was that space constricted slightly with the clock.